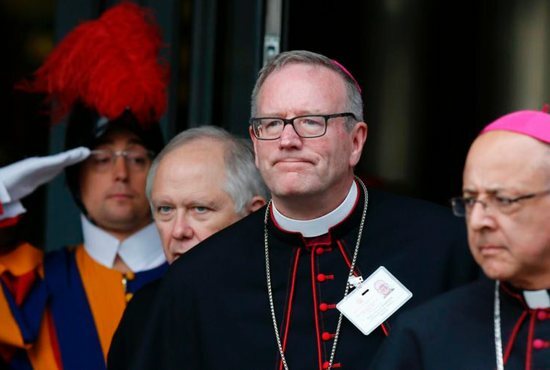 The Catholic Church needs to communicate the beauty and intelligence of faith to young men and women without resorting to condescending and aggressive methods, Auxiliary Bishop Robert Barron of Los Angeles told members of the Synod of Bishops. A “renewed apologetics and catechesis” can help young people who are tempted to leave the church due to convictions “that religion is opposed to science or that it cannot stand up to rational scrutiny, that its beliefs are outmoded, a holdover from a primitive time, that the Bible is unreliable, that religious belief gives rise to violence, and that God is a threat to human freedom,” Bishop Barron said in his speech to the synod Oct. 4. “I hope it is clear that arrogant proselytizing has no place in our pastoral outreach, but I hope it is equally clear that an intelligent, respectful, and culturally sensitive explication of the faith (‘giving a reason for the hope that is within us’) is certainly a ‘desideratum’ (‘desire’),” he said. Later that evening, Bishop Barron joined Nigerian Bishop Godfrey Igwebuike Onah of Nsukka at an event dedicated to the synod on youth, faith and vocational discernment. The University of Notre Dame’s Center for Ethics and Culture sponsored the event in Rome. Seven Notre Dame students spoke at the event about their faith, highlighting their positive experiences while also expressing their concerns that internal divisions and the scandal of sexual abuse are wounding the church. Bishop Onah, 62, told participants it was important for bishops to listen to young men and women, otherwise the synod risks becoming a meeting of “only old people” talking about young people.